While the quality of your skin is determined largely by genetics, the nutrients from your diet will affect the health of your skin. 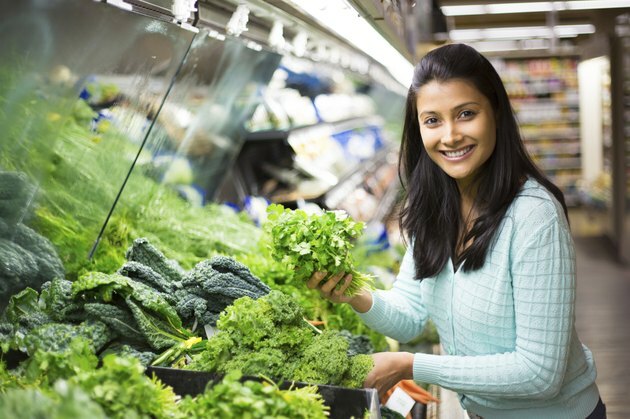 A healthy, balanced diet can possibly help reduce signs of aging and keep your skin supple and fresh. The U.S. Department of Agriculture recommends that you eat 2 to 3 cups of foods from the vegetable foods group each day. Your vegetable choices can affect your overall skin health, based on the type of vitamins they contain. Vitamin E is a natural antioxidant that provides protection from free radicals and toxins. Free radicals are produced during metabolism, and they can speed up the effects of the aging process, such as wrinkles in your skin. Vitamin E can also protect your skin membrane from UV damage. Vegetables naturally rich in vitamin E include avocados, dark leafy greens, sweet potatoes and yams. The recommended intake of vitamin E is 22.4 international units for all adults except for breast-feeding women, who require 28.4 international units. Vitamin C, like vitamin E, is a natural antioxidant that also provides protection from free radicals, potentially slowing down the aging process. Vitamin C is also needed to produce collagen, the protein that helps keep your skin elastic and supple. Vegetables rich in vitamin C include green peppers, broccoli, tomatoes, potatoes and leafy greens. The recommended dietary allowance of vitamin C is 75 milligrams for women, and 90 milligrams for men. Red, orange and yellow vegetables all contain carotenoids, which are the pigments that give the vegetables their color. Carotenoids are converted by your body into vitamin A, another natural antioxidant that, like vitamins C and E, can help slow down the aging process by providing protection from free radicals and toxins. Beta-carotene also protects your skin from sun damage. Veggies high in beta-carotene include pumpkin, red and orange peppers, carrots and, surprisingly perhaps, dark leafy greens. In the greens, the carotenoid pigmentation is "covered up" by chlorophyll, the pigment that gives the greens their color. The daily recommended dietary intake of vitamin A for women is 700 to 1,300 micrograms, while men should get 900 micrograms. Selenium is a trace mineral that increases skin elasticity and firmness, and, like beta-carotene, can provide protection from sun damage. It can also help reduce the effects of sun damage that has already occurred. Spinach, lentils, green peas and carrots are all sources of dietary selenium. Selenium is also found in high quantities in wild mushrooms, according to a study published in a 2008 issue of the "Journal of Environmental Science and Health." The amount of selenium in mushrooms varied depending on the type, but amounts ranged between 20 and 370 micrograms per gram. The recommended dietary allowance of selenium is 55 to 70 micrograms. Which Vitamins Are the Best as a Vegetable Substitute?